Mark Gumninger dredges up the past with a series of historical videos. Long before Titanic surfaced, Kenosha videographer Mark Gumbinger discovered that there was money to be made from shipwrecks. As a young man his father worked the pumps for a diver exploring the wreck of the SS Wisconsin, a passenger steamer that went down in a northeaster about five miles off the Wisconsin-Illinois border in 1929. He used to regale his son with tales of that and other Great Lakes wrecks, and Gumbinger has harbored a keen interest in maritime disasters ever since. But it wasn't until ten years ago, when he was down and out in sandlocked Scottsdale, Arizona, that Gumbinger realized there was an untapped market in people thirsty for tales of submerged vessels. He'd recently left his home in Kenosha, scuttling a chain of video stores, a lucrative career as a financial planner, and a sunken relationship, to try the "starving artist thing," he says. "I remember watching a sales tape and thinking I should be making that tape, not watching it." A job shooting medical films fell through when the company went belly-up, so he formed his own production company, advertising his services to corporations and law firms in the yellow pages. No one bit. "One day I walked into the Scottsdale library and stumbled across this book Ghost Ships of the Great Lakes," he says. "There was a chapter on the SS Wisconsin and all these other stories, and it really refueled my interest. I thought, 'Here I am sitting in the middle of the desert, but if I were back there I'd do a video on the SS Wisconsin.'" On a trip back home that summer, Gumbinger met some divers who had explored the wreckage of the ship. He spent three weeks taping interviews and doing research. His father provided narration. Over the next seven months Gumbinger rented out an editing studio in Phoenix and put a 50-minute video together for under $10,000. "I had been getting some PR and taking out some ads--I had a little PO box--but it really was a labor of love," he says. "I had nearly tapped out my Visa card, and I was really broke. I made this automotive-leasing video with this one guy and we thought that thing was going to make a fortune. We made a deal with a cable company to get a bunch of 60-second spots on it, but they ended up going bankrupt after we gave them our money. Then I started getting these checks in the mail for the SS Wisconsin video--three, four, five, six a day, and I thought, 'Hey, this is sort of cool.'" Gumbinger formed another company, Southport Video, and returned to Kenosha to make more shipwreck documentaries. There have been over 10,000 wrecks on the Great Lakes, says Gumbinger. So far he's made 11 videos on them (and one on the Andrea Doria). His latest is about the Eastland, the ungainly steamer that toppled onto its port side in the Chicago River just west of the Clark Street Bridge on July 24, 1915. The Eastland was top-heavy with picnicking employees of the Western Electric Company; an estimated 835 people lost their lives. Because she was on her way out to Lake Michigan, the disaster counts as a Great Lakes wreck. Its body count was the highest in the lakes' history. Gumbinger's videos are low-budget affairs, but they're exhaustive. He researches, produces, directs, and edits them, leaving the scriptwriting for Michael Schumacher, a writer known for his biographies of Phil Ochs and Allen Ginsberg. Typically Gumbinger shoots interviews with a cadre of maritime historians he's cultivated over the years. Many of them are crusty old squids who know the particulars of the wrecks in frightening and obsessive detail, though in The Eastland Disaster a young woman named Mary Bonevelle holds her own, remarking that most of the dead were laid out for identification in what is now the home of Harpo Studios. The interviews are cut with archival photographs, primitive computer animation, and sometimes ghostly underwater footage of wreckage. Gumbinger says he now makes enough from the videos to pay his bills--but barely. "I'm obviously not MGM," he says. "But I try to tell a nice story and try to give the people as much bang for the buck as I can. I discovered that I had the right formula where I could make a video and sell a couple hundred copies and profit from it without competing with the networks. 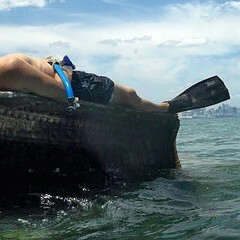 It's very much a niche market, but there are a lot of people out there that are into shipwrecks." Gumbinger sells a lot of videos through his Web site (www. edmundfitzgerald.com), but he also has a mailing list with 2,500 names, including schools, libraries, museums, gift shops, and shipwreck junkies, some of whom have collected the entire series. But what is it about shipwrecks that people find so compelling? "You have these ships that rout in storms or sink due to collisions or fog, and you have these dramatic rescues, and some people make it and some people don't," he says. "Or there's a mystery, like the Edmund Fitzgerald, where there were 29 men on board and all 29 vanished without a trace. One minute they're on the radar screen, they're talking to the ship behind them, and then they just vanish. It can be morbid, but I don't approach it that way. I try to be respectful because these are underwater graves."